The Samsung Exynos 5433 Octa (also called Exynos 7 Octa) is a 64-bit capable system-on-a-chip (SoC) for smartphones and tablets. 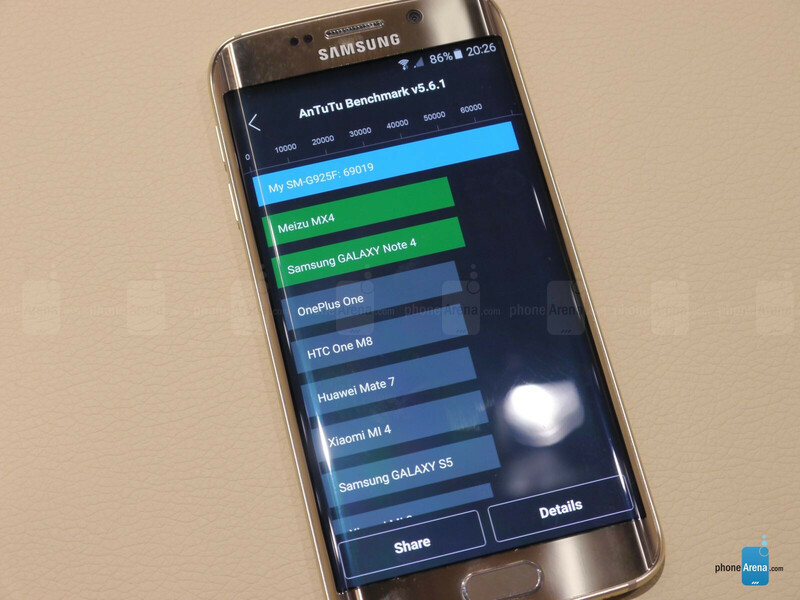 It was launched in September 2014 alongside the Samsung Galaxy Note 4 and features four Cortex-A57 cores clocked at up to 1.9 GHz. Furthermore, there are four additional Cortex-A53 cores at up to 1.3 GHz, an ARM Mali-T760 MP6 GPU and a 2x 32 bit LPDDR3-1650 memory controller (up to 13.2 GB/s). Cortex-A57 and Cortex-A53 represent the successors of the Cortex-A15 and Cortex-A7 architecture. In addition to some small tweaks leading to a somewhat higher performance per clock, both Cortex-A57 and -A53 are now 64-bit capable ARMv8 designs (Cortex-A15 and -A7: 32 bit ARMv7). Overall, the multi-threaded performance is similar to the Nvidia Tegra K1 and slightly above the Apple A8. However, the dual-core A8 wins most single-threaded benchmarks. While the powerful Cortex-A57 cores will handle complex software and games, the SoC can switch to the more efficient Cortex-A53 cluster in less demanding applications. If necessary, it's possible to activate individual cores from each cluster or even all eight cores at the same time. This concept developed by ARM is known as "big.LITTLE" and intended to improve the battery life. The Exynos 5433 integrates a Mali-T760 MP6 GPU, which offers six shader clusters (not yet confirmed) clocked at up to 700 MHz (206 GFLOPS). The Mali-T760 supports OpenGL ES 3.1, OpenCL 1.1 and DirectX 11 and offers a performance similar to the Adreno 420 (Snapdragon 805) or PowerVR GX6450 (Apple A8). Thus, the GPU is one of the high-end solutions as of 2014 and can handle even the most demanding Android games in high resolutions (Note 4: 2560 x 1440 pixels) and detail settings. The Exynos 7 Octa, which is manufactured in a 20 nm process by Samsung, should have an estimated TDP of about 3 to 4 W. Similar to other high-end SoCs, it is possible that sustained load will lead to throttling of the CPU or GPU (especially in smartphones). The Samsung Exynos 7420 Octa (also called Exynos 7 Octa) is a high-end system-on-a-chip (SoC) for smartphones and tablets. It was launched in March 2015 alongside the Samsung Galaxy S6 and features four Cortex-A57 cores clocked at up to 2.1 GHz. Furthermore, there are four additional Cortex-A53 cores at up to 1.5 GHz, an ARM Mali-T760 MP8 GPU and a 2x 32 bit LPDDR4-3104 memory controller (up to 24.8 GB/s). It is one of the first fully 64-bit capable ARM SoCs for Android devices. Cortex-A57 and Cortex-A53 represent the successors of the Cortex-A15 and Cortex-A7 architecture. In addition to some small tweaks leading to a somewhat higher performance per clock, both Cortex-A57 and -A53 are now 64-bit capable ARMv8 designs (Cortex-A15 and -A7: 32 bit ARMv7). Thanks to its advanced 14 nm process, clocks and performance of the Exynos 7420 are quite stable even in long-lasting benchmarks. Overall, the cpu performance is above the Nvidia Tegra K1 or Qualcomm Snapdragon 810. The Exynos 7420 integrates a Mali-T760 MP8 GPU, which offers eight shader clusters clocked at up to 772 MHz (302 GFLOPS). The Mali-T760 supports OpenGL ES 3.1, OpenCL 1.1 and DirectX 11 and offers a performance above the Adreno 430 (Snapdragon 810) or PowerVR GX6450 (Apple A8). Thus, the GPU is one of the high-end solutions as of 2015 and can handle even the most demanding Android games in high resolutions (Galaxy S6: 2560 x 1440 pixels) and detail settings. The Exynos 7 Octa is the first smartphone SoC to be manufactured in a 14 nm process with FinFETs (Samsung LPE). Therefore, the Exynos 7420 is one of the most energy efficient chips in early 2015 and runs much cooler than the competing Qualcomm Snapdragon 810.